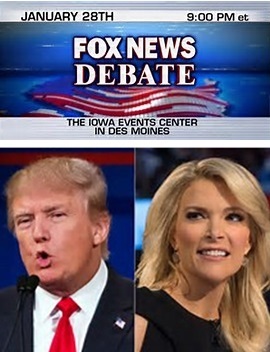 Donald Trump boycotted this debate to protest his treatment by Fox News' Megyn Kelly in the previous debate. This debate took place on Jan. 28 in Iowa, in the lead-up to the Iowa caucus on Feb. 1, 2016. The mainstream media reported on the popular vote percentages at the Iowa caucuses, but that isn't the purpose of the caucuses -- their purpose is to elect delegates to the national nominating conventions. We report on the delegate counts resulting from the Iowa caucuses below, because no other results matter. When you hear TV pundits say the Democratic caucuses in Iowa were a "virtual tie," (because the popular vote was 49.8% to 49.6%), you should shout at your TV that they are wrong -- the delegate count was 29 for Hillary Clinton and 21 for Bernie Sanders, because Democratic county delegate allocations tend to amplify small leads when tallying up into actual people who will serve as delegates to the convention. The mainstream media usually doesn't bother with actual figures: they simply spout half-truths and expect us to believe them. Knowledgable voters don't believe the mainstream media. The Washington Post wins this week's prize for laziest mainstream media analysis; in their article "analyzing" the Iowa caucus results, they spouted: "For Hillary Clinton and Bernie Sanders, the virtual tie likely means an even split of the 44 delegates." That statement is false; the split was 29-21, not even at all. That would be obvious to anyone looking at the allocation system (which evidently does not include the Washington Post). When you hear those same TV pundits pontificate about how Ted Cruz beat Donald Trump handily, you can again shout at your TV about how wrong they are -- Cruz gained exactly one delegate on Trump (8 to 7), and Rubio also got 7 -- now THAT'S a "virtual tie". (Republicans use a proportional delegate allocation system so there's no "amplification"). We summarize in our Iowa caucus results the delegate counts including superdelegates. All counts are estimates and you may spot differences depending on what news source you observe -- that's because the actual Iowa representatives won't be selected until their county conventions and statewide convention are held later in 2016. We rank according to the total delegate count: due to the Iowa caucuses, Marco Rubio (not Ted Cruz) took the lead from Jeb Bush (not Donald Trump). Moderated by Megyn Kelly and Chris Wallace.